The sink was a Craigslist find from a house being gutted in downtown Indy, which of course makes me so sad that such a special piece was unwanted by someone else. 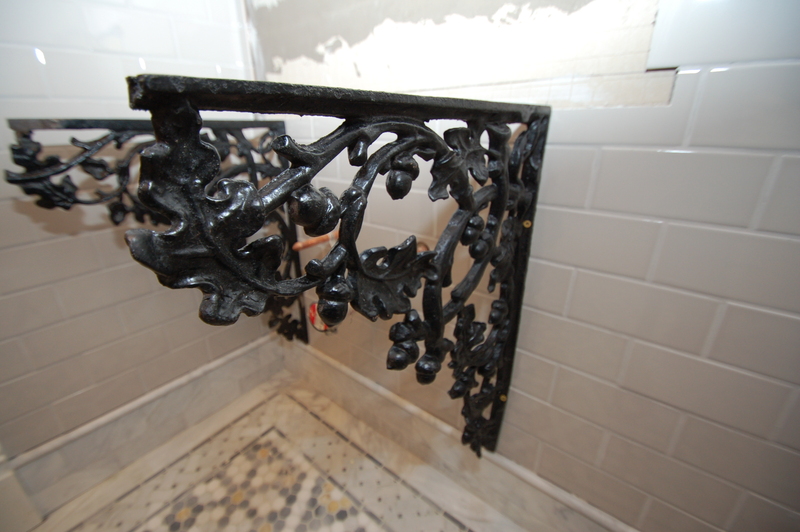 It came without brackets, but we found some that really resemble a similar set in an antique bath fixture catalogue. 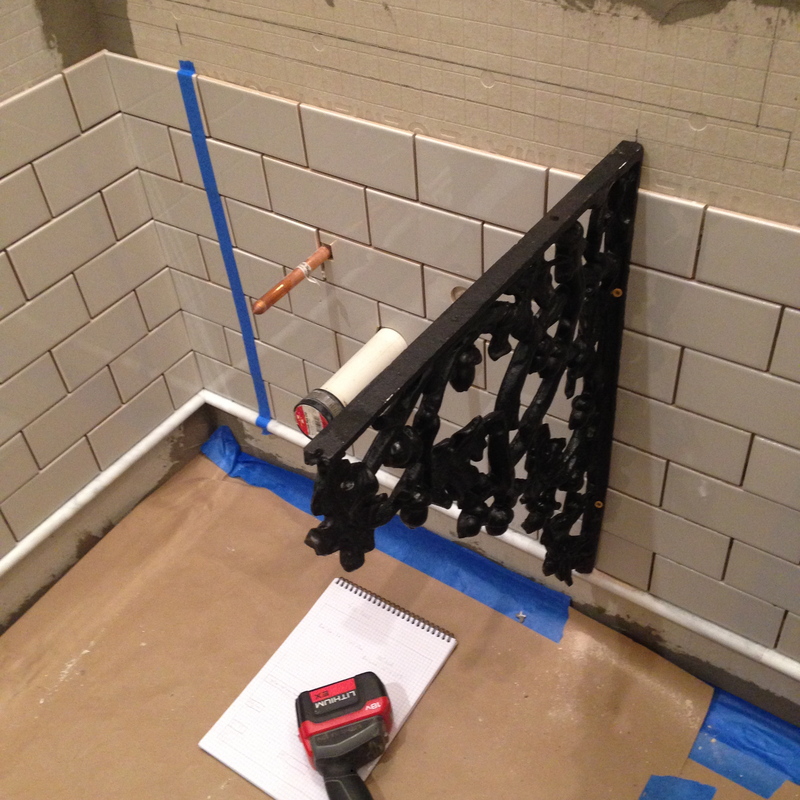 Lots of measuring and exactness to be done here – so tape and markings to keep track of everything, and to protect the tile when drilling, as well! Don’t worry, I’ll paint the screw holes! 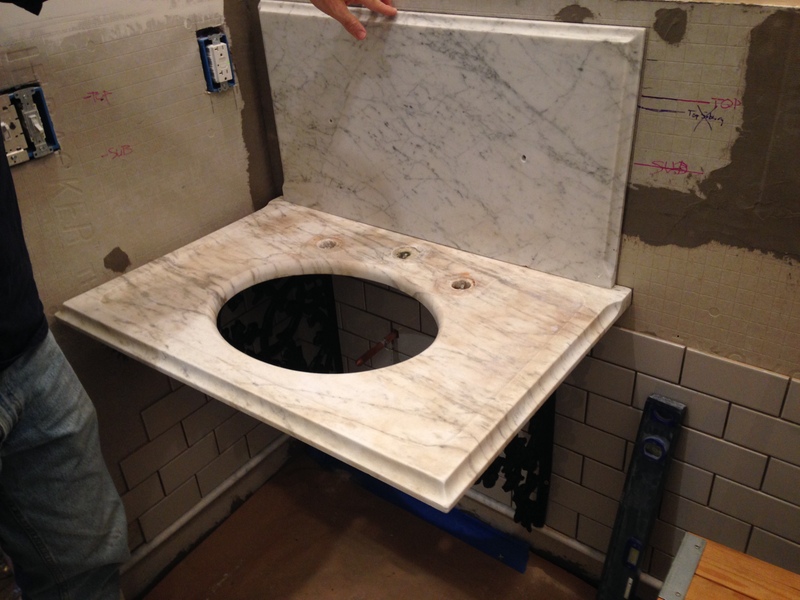 The brackets have a lot of marble to hold up! I think I need to do another round of stain lightening – some of the brown has come back since 6 months ago when I worked on it! 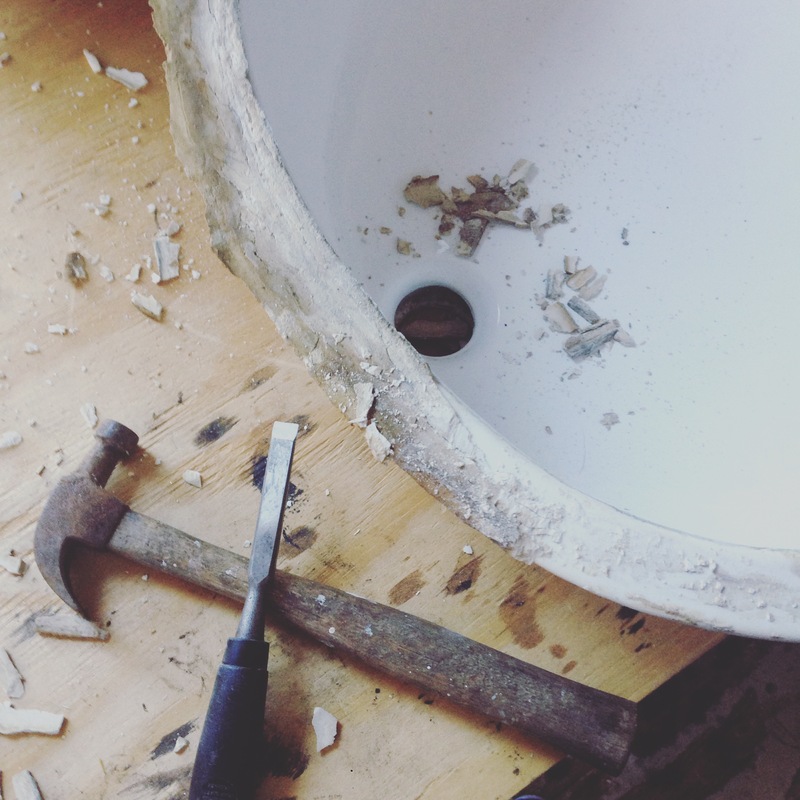 The sink had a lot of old residue and adhesive on it, so I took a chisel and hammer, and CAREFULLY knocked it off. 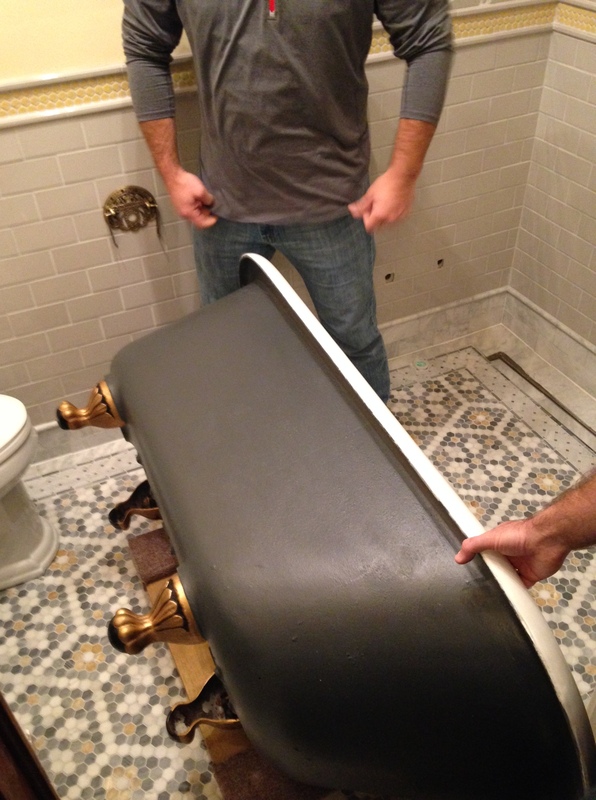 Doug did the same to the underside of the sink. 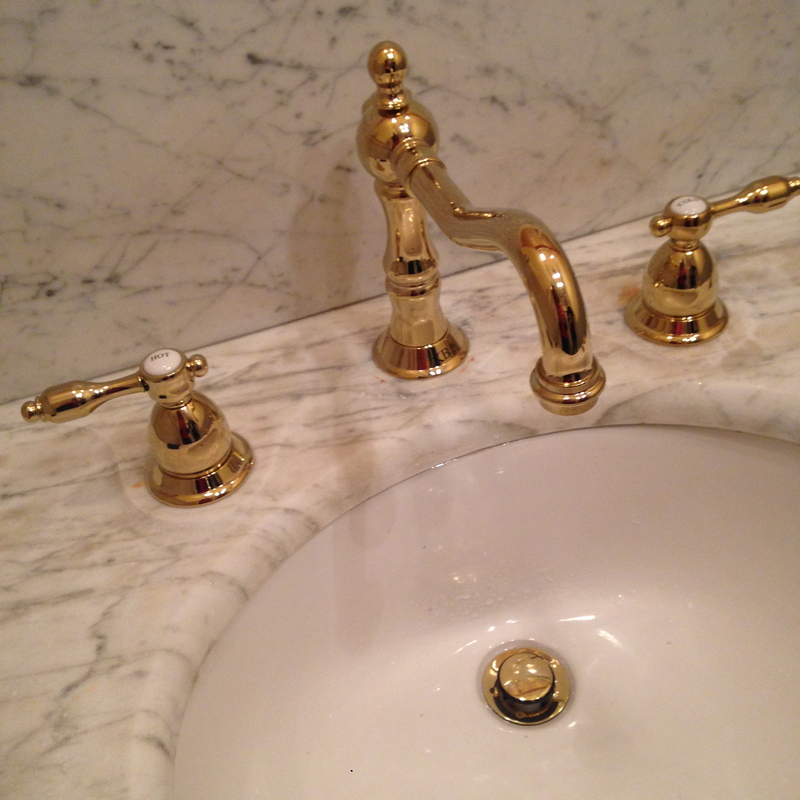 Modern fixtures, in a classic style! 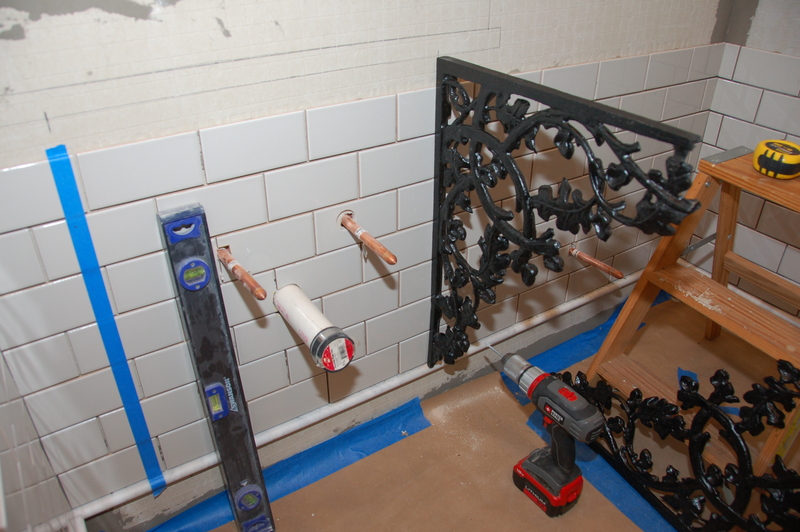 We’re waiting on a couple of brass pieces to switch out here, but all the exposed plumbing will be brass, as well. And are those not the CUTEST cut-off valves you’ve ever seen?!?! 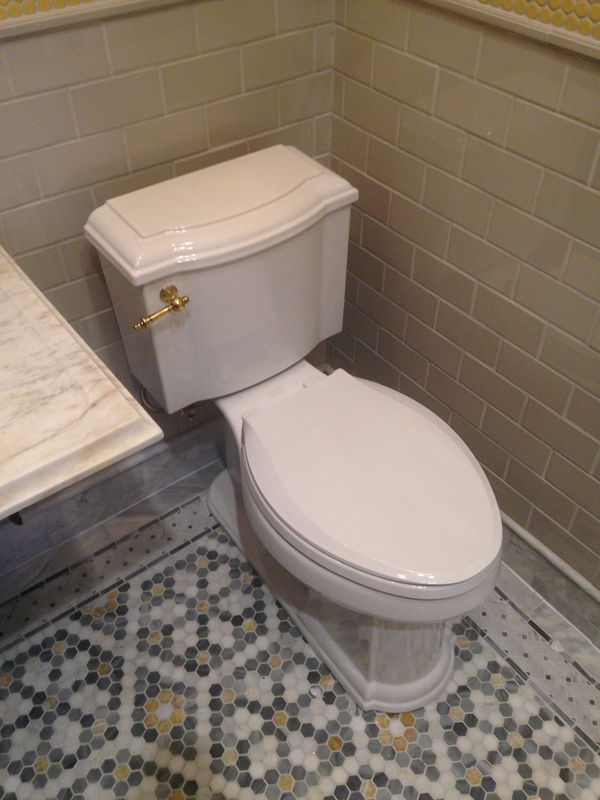 While generally I LOVE chrome fixtures the most, I thought the gold brass would really play off the yellow tile – and with 5 bathrooms, I have some room to play. The toilet is modern from Lowe’s. 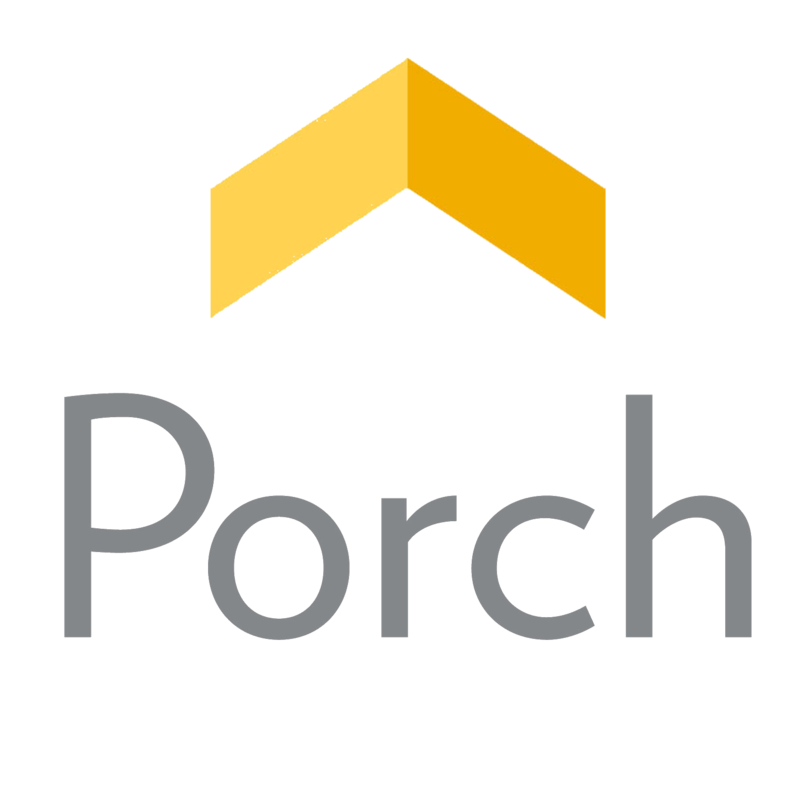 I like the details on it, and we added the brass handle. I initially wanted a high-tank toilet, but Doug made the point that this is the main visitor bath, and we didn’t want anyone to feel confused, or like they had to ask for directions. He’s so dang practical, that one. And, that decision allows us to build a wall-to-wall apothecary cabinet above, so it’s a win. The wrapping paper above is hiding the hole for the future cabinet – which I hid when we had our holiday parties! 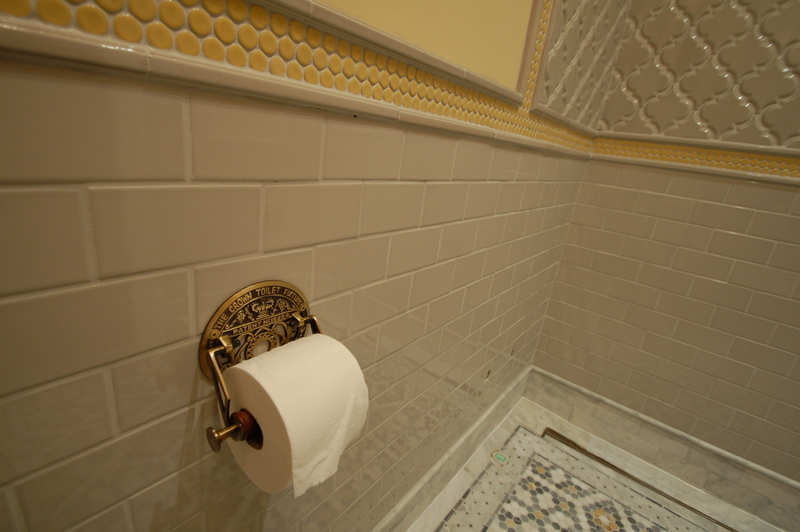 Even the toilet paper holder is fancy! 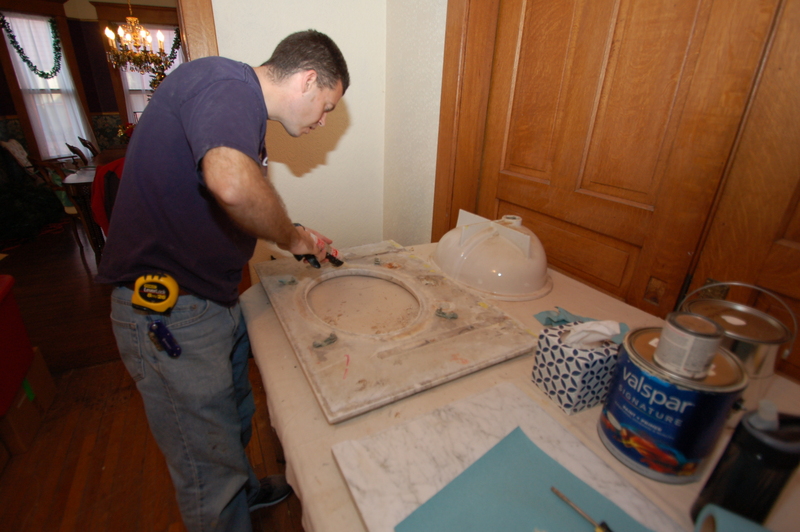 We switched out the old door – which was painted white and had one decent crack in it, with this one that we found at a salvage store. The door matches the rest of the downstairs doors REALLY well. 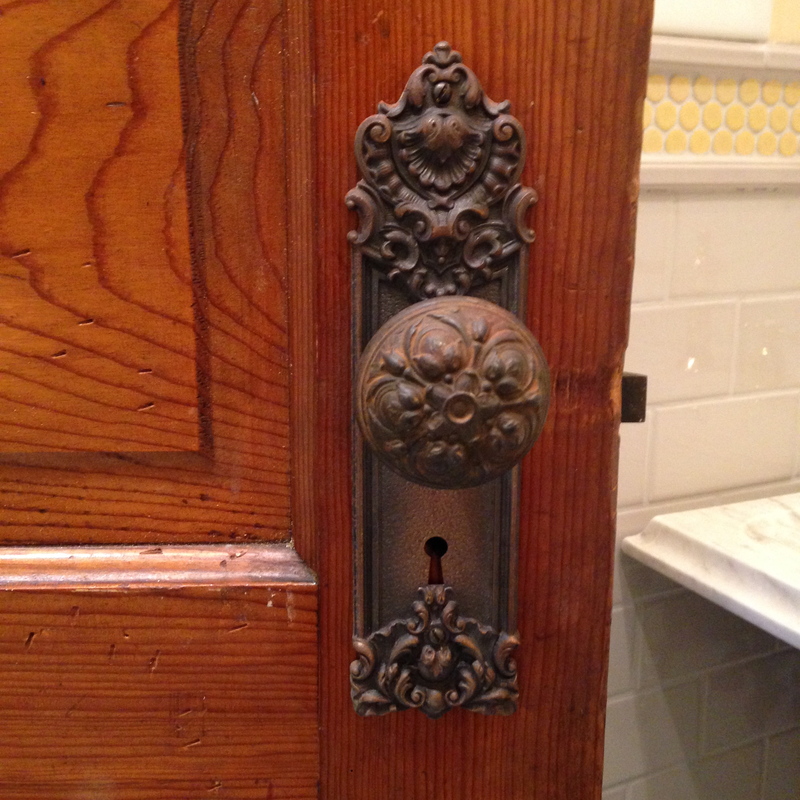 And we found some door hardware at Preservation Station that also coordinates with the downstairs hallways. Doug was running a race in Nashville, so we went by – it’s a great place to find goodies! I love the warm wood in the room…. Our friends Edgar and Veronica came over to help us move the tub in. 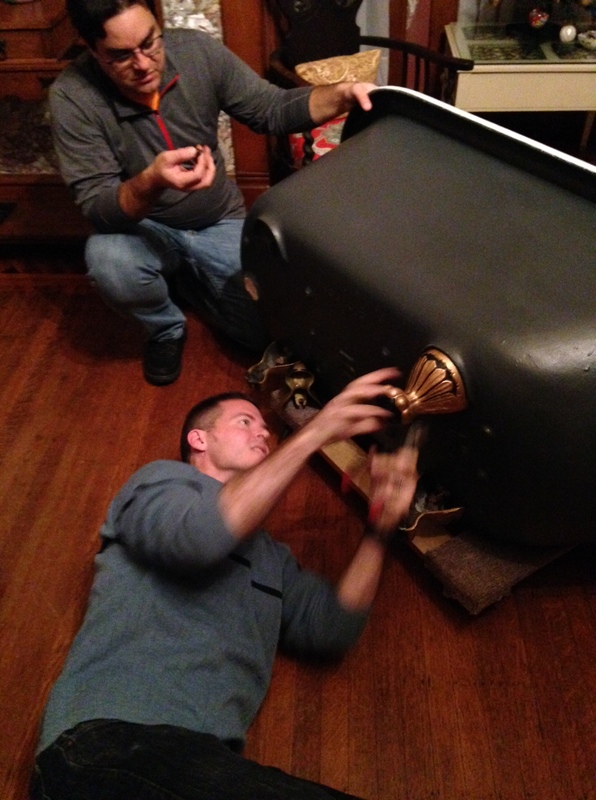 Doug and Edgar moved it on a dolly, on its side. There was not enough light, we moved pretty quick, and I used my phone. So the pictures are TERRIBLE. I’m sorry. 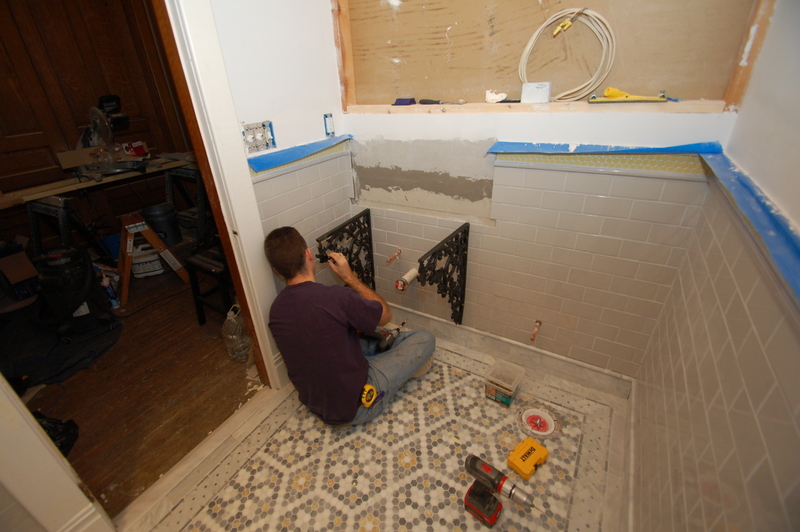 Next up : Getting the shower and tub fixtures installed!!!! YAY! 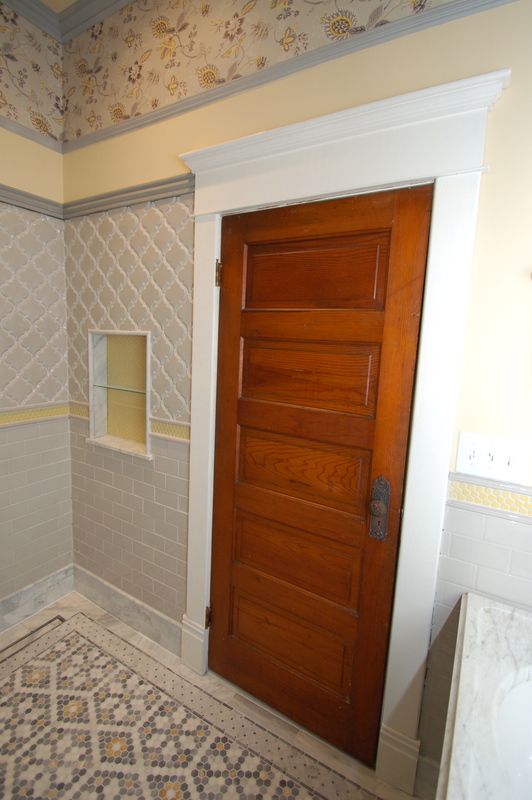 Love, love, love this bathroom. 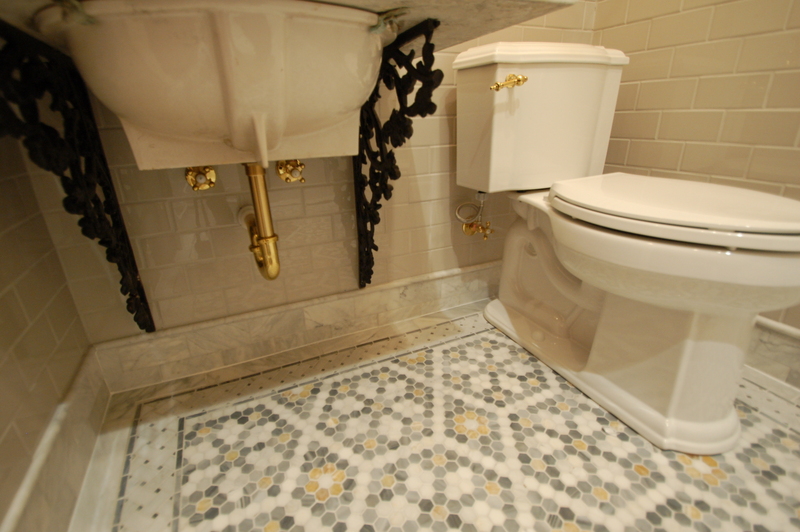 Your tile design is beautiful! 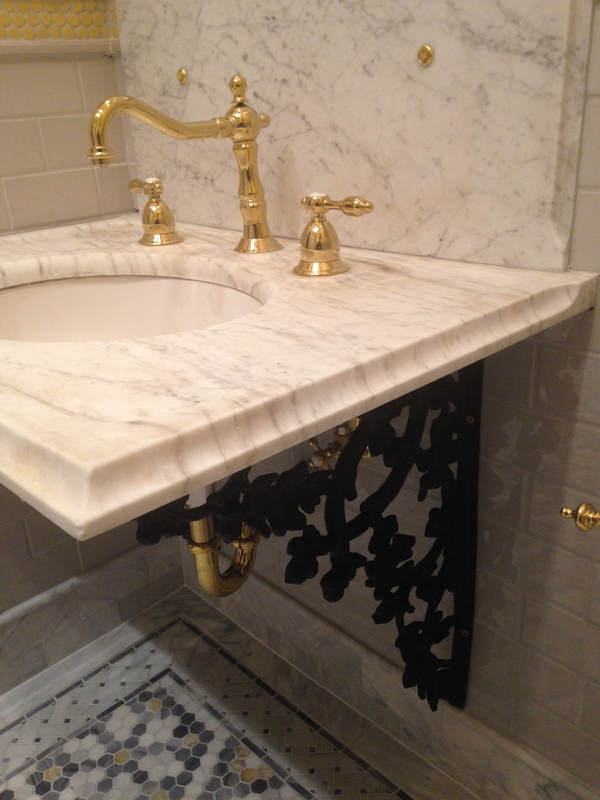 I am exceedingly jealous of the marble vanity! I have been looking for one for two years! I can find them, but only for $$$$$$$! I may just have to come to your house to wash my hands! PLEASE DO! And I’ll come to the Cross House and just run up and down the staircase to admire. Sound good? 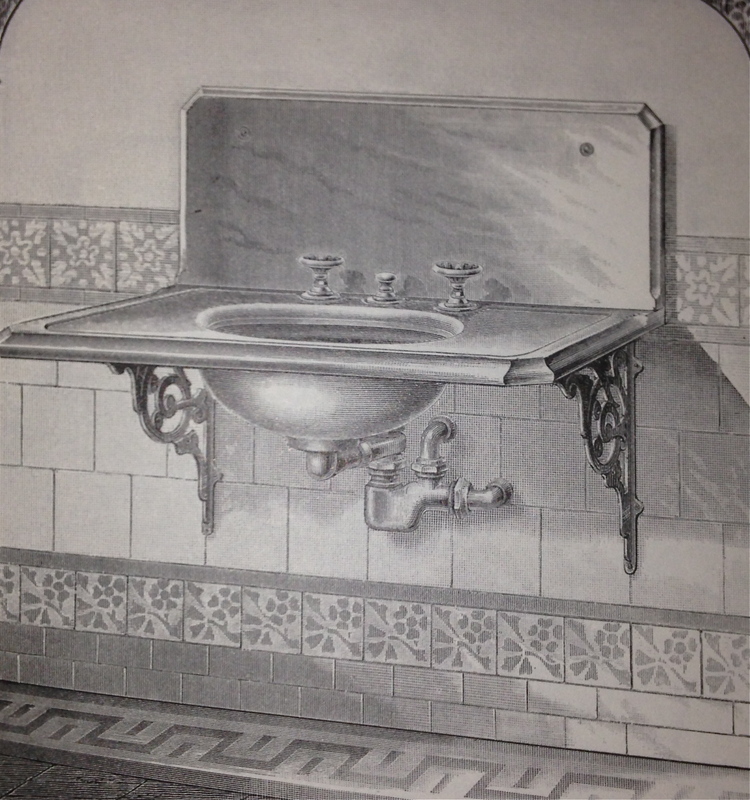 I’ve been keeping my eyes peeled for another sink like this for you – so I have the upper midwest handled! Because you NEED one. 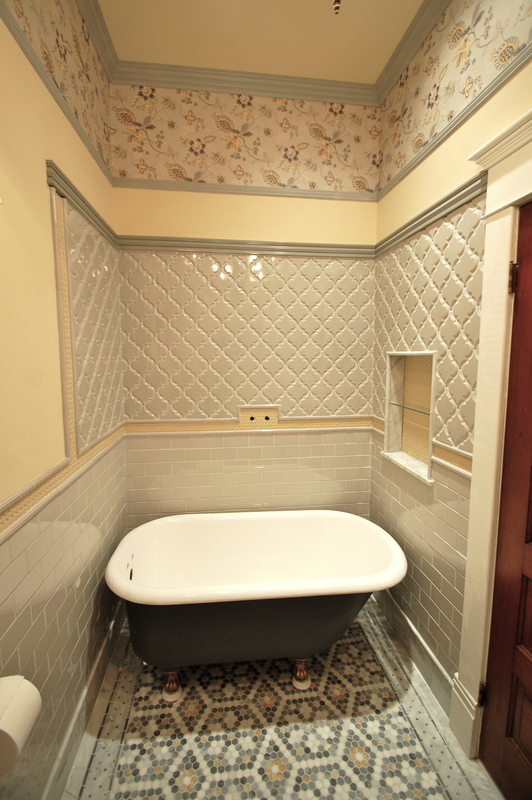 This is one of my favorite bathrooms ever! You should be incredibly proud of it. I’m sure your house is swelling with pride! 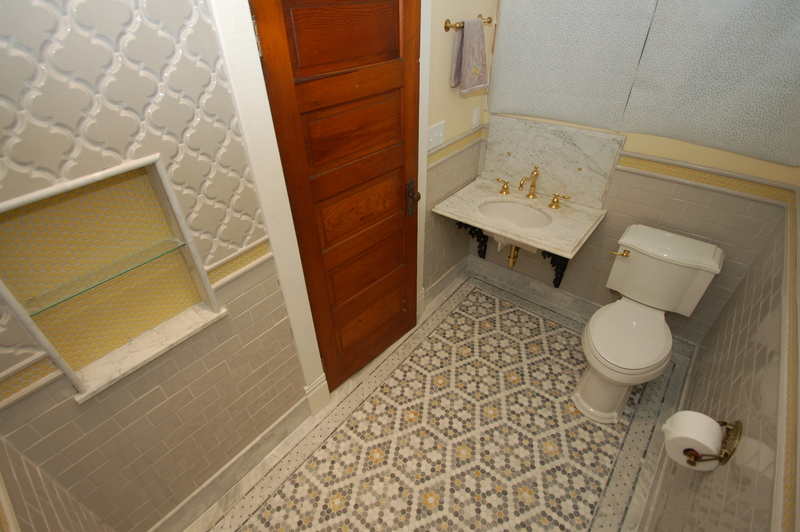 That is one beautiful bathroom! Fantastic design. I’m so excited for you! It’s fabulous! I love it! 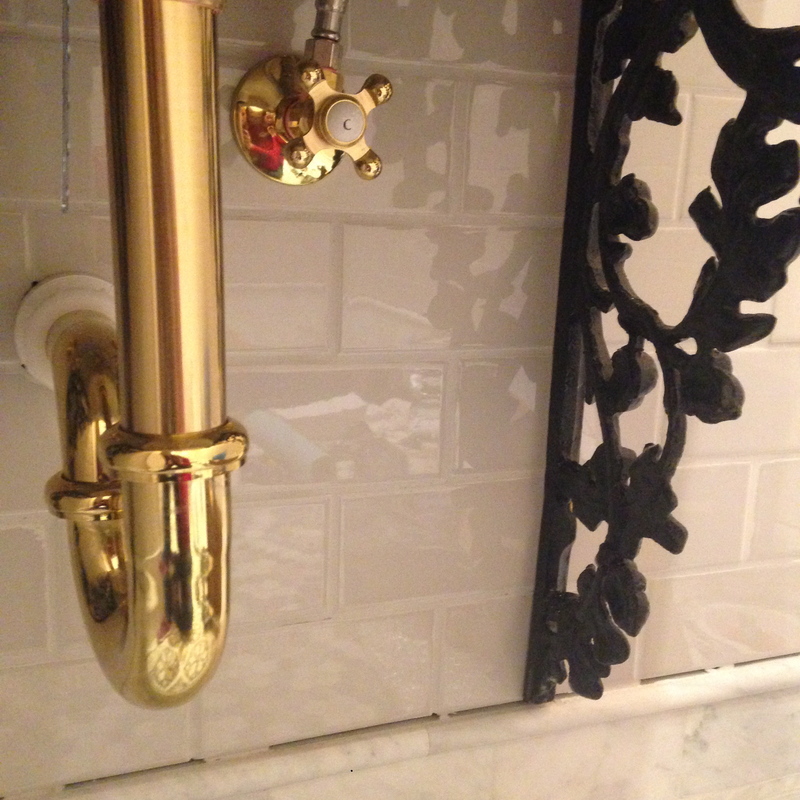 Are the tiny brass dots on the back splash bolts anchoring it to the wall? It’s all so beautiful, Amy. Every bit of it. I’m still blown away by that gorgeous floor. I want to go on the record and just say WOW! 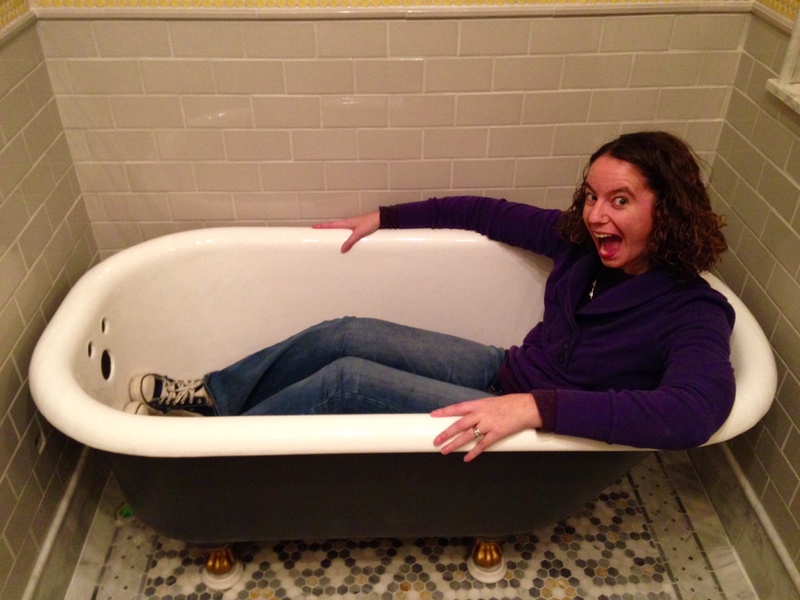 Beautiful finishes and that tub looks really good on you!!! Wow I am sure your victorian is feeling like a real lady now. Soo beautiful. You made yellow look beautiful and timeless. It’s going to be stunning. Beautiful job. Absolutely stunning! Just so lovely! 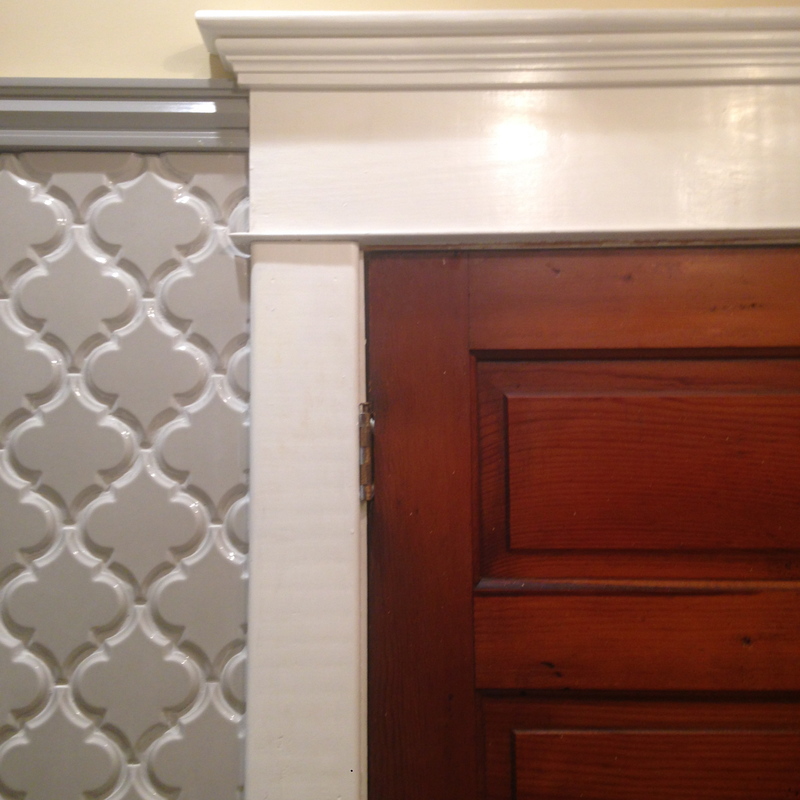 I have to ask…what combination of trim are you doing for your molding? I am committing the sin of removing the original trim (which only half exists in one room of the whole house so I don’t feel TOO guilty) and replacing it with something period appropriate but more my style. Fabulous job – it’s really coming together. I love how you and Doug have taken time to do this with skills, love and care (and craziness) – so refreshing not to see a room smashed out in a weekend / week! I’m excited to see the apothecary cabinet. OH WOW! I saw the video about the floor tiles..and its soo cool to see this all put together! looks fabulous! you are talented! I lack the words to describe how beautiful this bathroom is. The planning clearly shows. 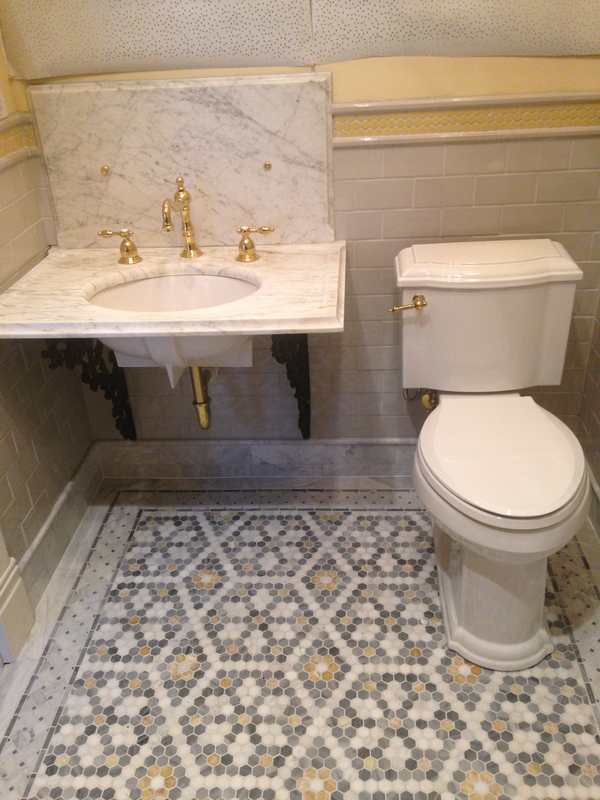 The different types of tiles, the colors, the coordinating wallpaper, the gold-toned hardware, the chandelier…just breathtaking. Modern decorating seems to eschew details, patterns, layers, and colors. 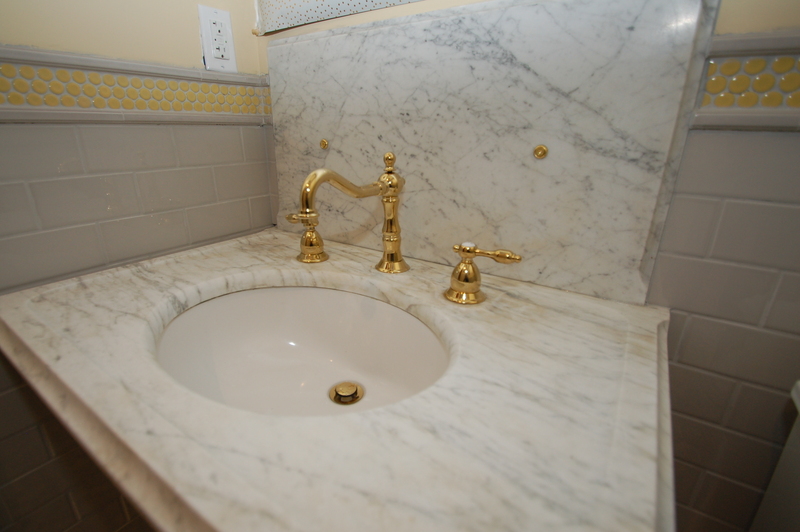 You have proven that even a bathroom can be beautiful if you take the time to plan it. I’m so inspired with everything you do. I hope you and Doug are proud of yourselves. Amy – another awesome (as usual) reno project. 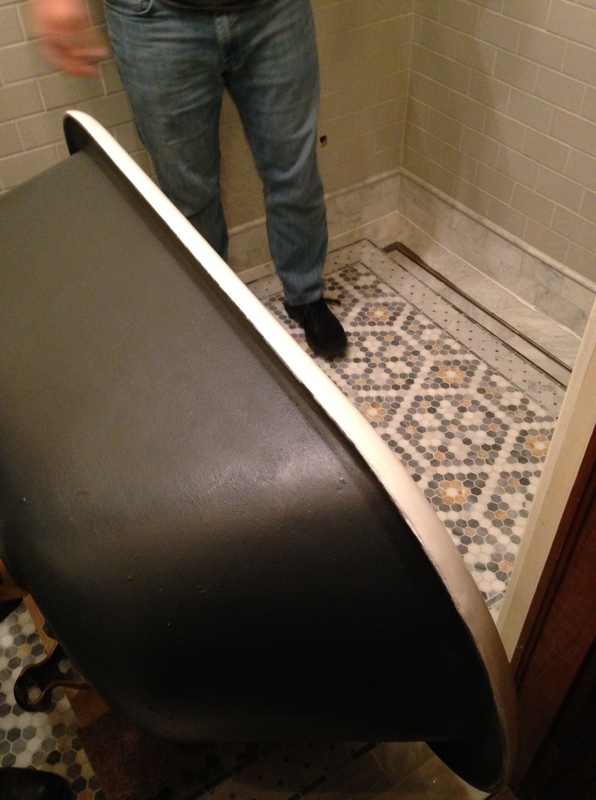 I have to ask – WHERE did you find that toilet paper dispenser?